The warehouse Marqués de Vizhoja is a familiy operation, founded in 1966 by Mariano Peláez. Marqués de Vizhoja would became the embassor of the Galician wine when the trade in Albariño was almost non existant. 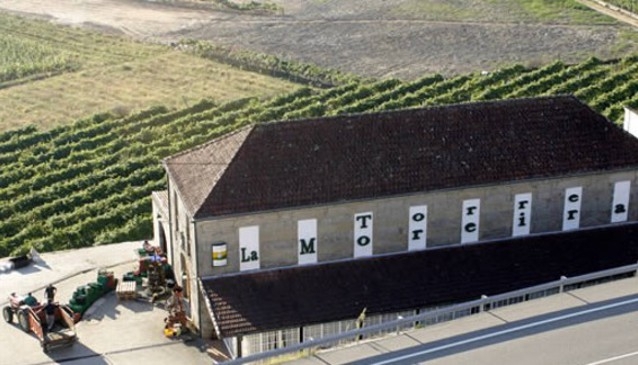 Around the chateau La Moreira with its military appearance built at the XVIIIth century, early grew a yellow carpet of albariño. At the 80s, two new wines will join with the most pure Galician flavour. Wine tradition reaffirms at the old warehouse of La Moreira, nowadays museum of ancient wine production proccess. Among its wall of stone, where there is a place to brany, we can see some barrels, a chimney, etc. From these ancient techniques to the inox deposits, the change has been enormous; the process has improved, but the way of producing wine has not changed very much in the last three centuries as to deny our debt with the ancients. The majesty of stone is moved to the second warehouse of Marqués de Vizhoja. This came from an ancient tobacco dryer that keeps at the ceiling the original wooden structure. Althought it seems to be a strange place for wine, the originality of the rectangular plant has forced to adapt the disposition of tanks to the long place; but its an special and different image. The old windows were made to easy the wind to flow, nowadays they are covered, so that nothing can disturb the production of wine at this special place. Here we see stone, wood and 26 tanks of inox in the warehouse. Genuine wines and symbols of the typical albariños all around, made up of the artistic and ethnological sensitivity, of Mariano Peláez philosophy shown to his sons. The most modern technology of this process includes a special transport of grapes to avoid they break and produce uncontrolled fermentations and grape juice acidification. The grape juice of part of the harvest is mix with another part that macerates together with the skin of the grape for 24 hours, which is as a cold semi-maceration, which has on the one hand the strong nature of the variety on the skin of the grape and, on the other hand, the most delicated and fruity flavour of the virgin grape juice.